With the PMT function, you are able to calculate the monthly payment for a loan, based on an interest rate, number of periods and the amount of the loan. If you adjust the rate, periods or amount, the formula result changes, so you can see the effect of these different variables. Instead of testing the results with a single formula, you can set up a data table, and compare the results, side-by-side. In this tutorial, you'll set up two data tables - one with 1 variable, and another with 2 variables. In this example, you will build a data table that shows the monthly payments for loan terms ranging from 1 to 6 years. The number of payments will range from 12 to 72. NOTE: The Input cells have to be on the same sheet as the data table. The loan information is in cells C2:C4, with the number of payments in cell C3. 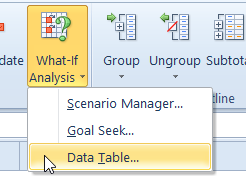 On the Ribbon's Data tab, in the Data Tools group, click What-If Analysis, and then click Data Table. Click in the Column Input cell box, and then click on cell C3, which contains the variable for the number of payments. 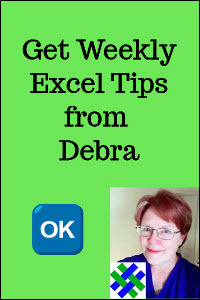 Click OK, to close the dialog box. 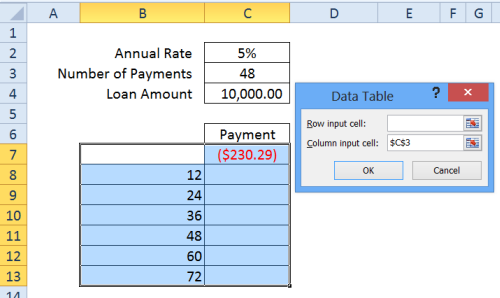 Select the cells with the monthly payments, and format as Currency. In the screen shot below, the format is Currency, with negative numbers bracketed and in red. Because the data table values are in an array, you cannot edit or clear individual cells. If you try to change one cell, you will see an error message - "Cannot change part of a data table." If you want to remove the entire table, or the resulting values, follow the steps below. Select all resulting values in the data table. 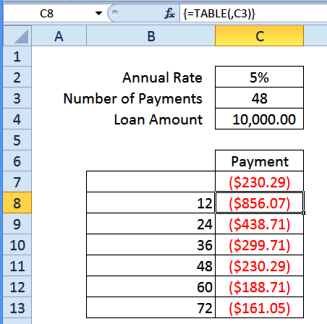 In this example, you will build a data table with 2 variables. It will show the monthly payments for loan terms ranging from 1 to 6 years, and interest rates from 2% to 6%. The loan information is in cells C2:C4, with the interest rate in C2, and the number of payments in cell C3. 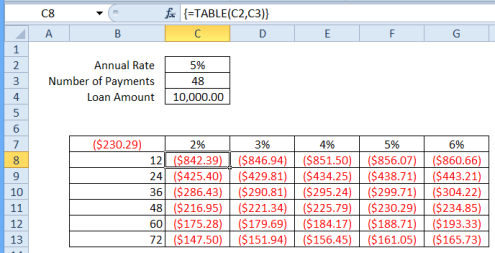 Click in the Row Input cell box, and then click on cell C2, which contains the variable for the interest rate. 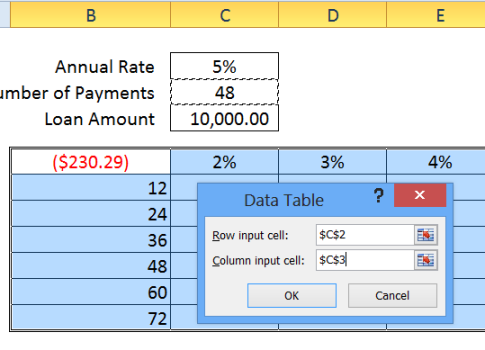 Click on one of the calculated monthly payment cells, and the formula bar shows that the cell contains a TABLE function, with cell C2 as the first argument, and C3 as the second argument. The curly brackets at the start and end of the formula indicate that this is an array function. 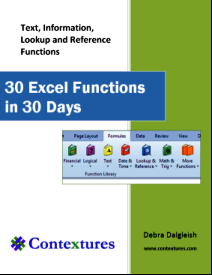 Click here to download the data tables sample file. The file is zipped, and in xlsx format, with no macros.